The avalanche danger remains MODERATE in Alpine terrain (>2,500') on steep slopes for hard slab avalanches breaking 1-3' deep. Although an avalanche will be difficult to trigger, the potential is there that one could bury or injure a person. At the treeline elevations (1,000-2,500') the danger is LOW where triggering an avalanche is unlikely. - We have rescheduled the CNFAIC Avalanche Rescue Workshop for January 18th due to minimal snow coverage at the parking lot level in Turnagain Pass. - Join us for our final Fireside Chat this Thursday, January 8th, in Anchorage! Topic: Mountain Weather and Snowpack. We will be taking a close look at the current state of the snowpack at Turnagain Pass along with a look into "when is it going to snow?". 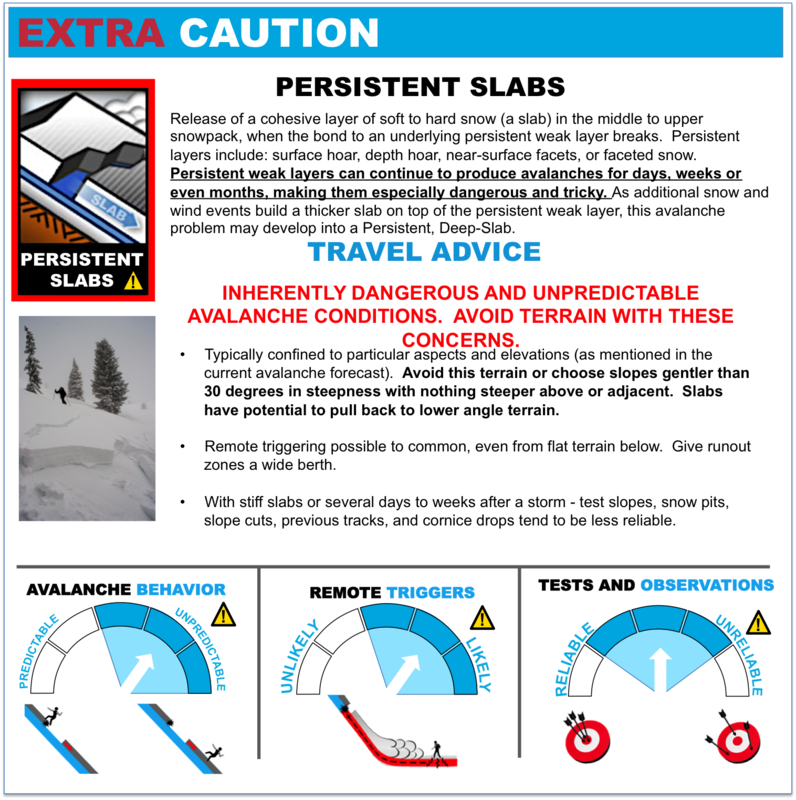 If you are getting out in the backcountry to enjoy the next few clear sky days - remember you can participate in this very interesting research project: "Understanding Travel Behavior in Avalanche Terrain: A Crowdsourced Approach". Researchers from Montana State University are looking for data sets worldwide and we can help provide some valuable AK data! As we roll into a several day period of high pressure and clear skies, don't forget what is lurking below the surface. Roughly 2' down (give or take a foot) are persistent weak layers that vary with region. Turnagain Pass is plagued with mainly buried surface hoar and in lower snowpack zones, such as the West side of Girdwood Valley and Summit Lake, varying degrees of a facet/crust combination also exist. Although the slab on top is very hard and dense, making it difficult for a person's weight to impact these layers, they are still there, not buried all that deep and continue to show signs of reactivity in pits. I was with an Avalanche Level 2 Refresher course yesterday and we dug several pits in the lower Alpine zone (~3000') focusing on the buried surface hoar. Test results were exactly what we saw a week ago - high strength (hard to trigger an avalanche) and high propagation propensity (if an avalanche is triggered, it has potential to propagate across an entire slope). Although time is on our side and the buried surface hoar has adjusted to its current load, it still doesn't buy a ton of confidence. Photos: Buried surface hoar that is laying 14-16" deep at 3,100' on Sunburst's SW face (Ryan Davis). Very hard and supportable wind slabs litter the mountainsides above treeline. These are generally 6-12" thick and fairly well locked into place in many areas. However, there is still a possibility of triggering one in very steep and rocky terrain. Chances also go up if the slab is unsupported from below (i.e., is sitting above a cliff, steep rollover or a steep gully sidewall). This also paints a picture of the current surface conditions in exposed, above treeline zones - hard and slick. Where stiff wind slabs are not present, scoured snow, rocks and anti-tracks are. Sounds a bit dire, yes, but there is fun riding to be had in sheltered areas in the trees as well as terrain depressions and the like. Mostly clear skies and light North winds greeted backcountry travelers yesterday. Temperatures were in the upper teens in valley bottoms and ~20F on the ridgetops. The last measureable precipitation was December 30th (the end of the very windy late December storm). Today, clear skies are on tap once again as a blocking high pressure has set in over mainland Alaska. A slight bump in Northerly winds (up to 10-15mph) are expected on the ridgetops. Temperatures are inverted this morning with valley bottoms in the single digits to low teens and the high teens to 20F on the ridgetops. We should see little warming through the day. Our weather the next several days will be dominated by this blocking high pressure. Later in the week, there is a chance it could break down in the Southcentral coastal zones bringing some clouds and a chance for snow flurries. You can bet we will be watching the longer range weather models for the next storm.